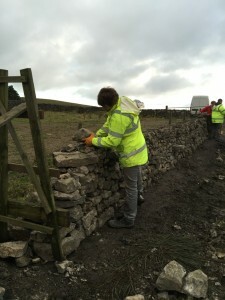 The Building Blocks project is a training programme for offenders on the Community Payback scheme, teaching them the skills of dry stone walling through practical sessions repairing damaged walls in Upper Nidderdale. Dry stone walls are a major part of our landscape, but keeping them in good repair takes a lot of effort. Course attendees are offenders sentenced to carry out a number of hours of Community Payback (what used to be called community service). Community Payback carries out an amazing range of tasks – approximately 55,000 projects last year nationally – and operates throughout many communities in a safe and carefully regulated way. This project works with small groups of 6 people on Community Payback at a time, supervised by the Community Payback Officer from the Humberside, Lincolnshire & North Yorkshire Community Rehabilitation Company. 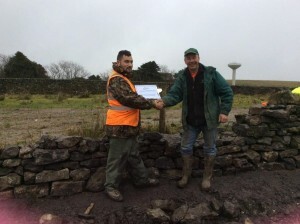 The course is led by experienced walling professionals who hold the Dry Stone Walling Association’s Instructor certificate. The instructor ensures that any wall built is to a good structural standard – they only allow the group to work on a short section of wall at a time, which must be completed to their satisfaction before moving onto to a new section. At the end of each 6 day course, Craven College assess the trainees who receive a basic qualification if they meet the required standard. We will consider working on any dry stone wall in Upper Nidderdale where the restoration of the wall has a clear public benefit. The location must also be reasonably accessible. Please contact us if you own land with damaged dry stone walls in the Upper Nidderdale area and would like further information.